You have probably spent hours planning the decor of your reception space. Picking out the perfect linens. Pouring over the ideal flowers for you stunning centerpieces. But have you thought about the lighting? One of the best ways to make a dramatic impact in your space is to play with lighting. So today I thought I would go over your lighting options and of course, show you some examples from past Magnificent Moments Weddings! So let’s get ready to shed some light on all thing LIGHTS! These portable lights can be placed around the room giving definition to even the most dull corners. Uplights are a great way to not only incorporate light but color into your reception space. Most DJ’s will have them available and many include them in their packages. Find the hue that best accents your decor, it really makes the space feel unified. When in doubt, go with amber – it looks like a candlelight glow! 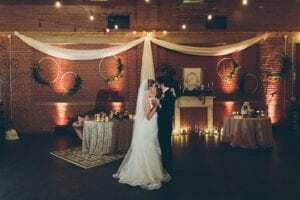 Whether you want to go vintage with Edison bulbs or modern with cafe lights, hanging lights are a great way to create a romantic setting for you event. 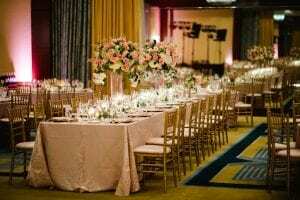 Drape them from the ceiling over guest tables or dim them low over the dance floor. You really can’t go wrong with this look. Weddings and candle light go hand in hand, they were made for each other. Line guest tables, gift tables, and buffets. Create a cascade around your sweetheart table. The possibilities for candlelight really are endless. Here at Magnificent Moments Weddings, we’re convinced the more candles, the better the wedding! It is pretty clear to see that a little lighting can really go a long way in making your event feel finished and of course uniquely you! Need help planning your big day? Contact Magnificent Moments Weddings we would love to help plan every detail, big and small!